We have a similar bed linens set up. Plus, we don’t have decorative pillows on the bed. There’s always that question about what to do with them at night that doesn’t get the cats fighting over the prime sleeping spot! So no decorative pillows. Good point about decorative pillows – they look nice but are super impractical. And I love the mummy idea! I do use a top sheet, but since I live in the subtropics, no need for a duvet or bedspread, just a light blanket at hand if called for. I agree with Priscilla about decorative pillows which I find to be a bit of a nuisance. When I need to buy new sheets, I will be buying them at Costco. I want to support retailers with fair labor practices. I quite like your duvet! Isn’t it nice to have simplified sheeting, one way or the other? 3) Take care of our employees. Glad you like the duvet! Animal shelters often also accept (or actively seek out) old sheets and towels. Another place to donate the old stuff. Good call! Thanks for adding that resource, Em. There’s a lot of great tips in this article and in the comments. I didn’t know that Costco is a good source for sheets. I still use top sheets and blankets I’ve had for 20+ years; some were hand-me-downs from my grandmother and mother-in-law. Speaking of mother-in-law, she said she found over 50 (!) sets of sheets when cleaning out all the closets and drawers in her large home. Pillowcases always need replenishing in my home because my spouse and I have very oily hair. I prefer to buy them at thrift shops, which usually have a much wider selection of colors and patterns in bedding than one can find nowadays in mass-market stores. I just read something recently from someone looking to keep pillowcases oil free for acne-related reasons, and they mentioned using a fresh rectangle of muslin as an overlay on her pillows each night and then just washing those regularly so the pillowcase stays in tact longer. Not sure if that would work for you all… But of course thrifting pillowcases is also a great solution, especially given the colors & patterns you mention – fun! Oh buggar, like the rest of our closet so overwhelms our linen space! We are definitely top sheet people. (though for a long while in high school and early college I was a comforter only, bottom sheet didn’t always make it either). We are crazy about the never ending search for the perfect set of sheets and pillows. I also seem rough on comforters and quilts so they don’t stay fluffy long enough. Also due to some health issues at times my adjustable bed is the only comfy place to live – so tv, meals, reading and sometimes sleeping all in one spot. So the quilts don’t stay spotless and then our washing machine beats out the fluffiness left there! (Probably could go to a laundry mat and use a larger machine – we have a pile to try that with). So bedding is my vice! Our guest bedroom has to many options too. It’s a ice box compared to the rest of the house. So there are flannel, Jersey and regular sheets depending on who is here. Then there is a quilt and a comforter. Not to mention before the guest bed was the guest bed, it was sometimes the main bed (Goldilocks and I are always searching) – so we have the sheets and quilt we preferred. 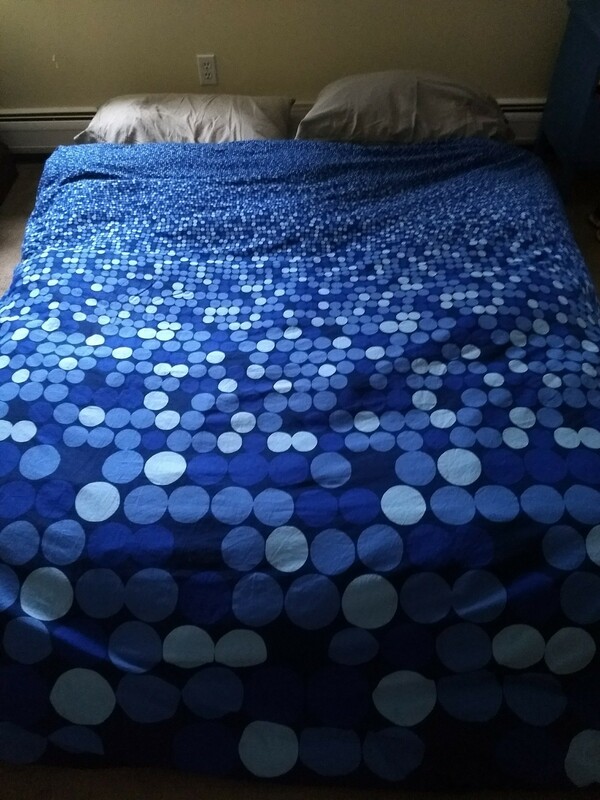 Ok so I might have a few vices – perfect bedding is one of them. I also suffer from insomnia (hello typing this at 3:45 AM) so my sleep environment is really important – so they say, I’m still working on it but those perfect cool sheets, supportive pillow, tempature right bed spreads – it’s magic!! Hi to all the thifting family! Love the Goldilocks reference! I think if you find the perfect combo and it makes a big difference, it’s worth all the searching along the way. And with bed being a central spot, it makes sense to have extra sets of things on hand.